Fig. II-5. Right Ascension Versus Declination Plot Including Both Solutions From Each Ambiguous Pair. Concentration of points near declination of -8 deg indicates correct solution should be in that region. Fig. 11-6. Right Ascension Versus Declination Plot Keeping Only Selected Solution From Each Ambiguous Pair for the Same Data as in Fig. 11-5. Note the greatly reduced range on the axes relative to Fig. 11-5.
v where Wf is the weight assigned to each selected attitude solution. The summation is over all the selected attitudes in the block. The selected attitudes are then compared with the average attitude, and any that differ in arc-length separation by more than No are rejected. (N is normally chosen in the range 3 to 5.) A new averaged attitude is calculated from the edited group of attitudes. This editing procedure is repeated until no additional attitudes are rejected. A goodness-of-fit parameter associated with the averaged spin vector and the M attitudes remaining is defined as o/A/. In a similar manner, other ambiguous solutions present in the original unresolved set of attitudes are selected as trial attitudes and the whole procedure is repeated. The averaged spin vector and the set of attitudes associated with the lowest o/M value are selected as the true set of attitude solutions. After the resolution of ambiguous solutions, the processing is the same for all the methods. The a priori attitude, or the selected trial attitude, is used to process the unresolved block of attitudes. The chosen attitudes are then averaged to obtain a new attitude estimate. The chosen attitudes are residually edited in iterative fashion until a self-consistent set of solutions remains. In practice, the laborious search for a trial attitude is conducted over a small subset of data because processing time is proportional to the square of the number of solutions in the original set. In addition, for a trial search to be successful, it is necessary for at least one attitude in the block to lie close to the final averaged attitude and for the true attitude solution to vary more slowly than the false attitude solutions. A time-varying attitude or large systematic or random errors present in constant attitude data would result in wildly fluctuating attitude solutions and can cause the block averaging process to fail. A second possible method for evaluating the quality of solutions is to compute statistical indicators. For example, standard deviations can be calculated for the sets of solutions associated with each method separately, for an average of the single-sensor methods for each Earth sensor and for an average over all the attitude methods. In this section, we calculate the uncertainty in deterministic single-axis solutions due to both the statistical noise on the data and estimates of any systematic errors which may be present. The purpose of this calculation is both to determine the attitude accuracy available from given measurements and to provide weights for the various data and measurement types as described in Section 11.2. Attitude uncertainties can be obtained through two different approaches. In the direct calculation procedure discussed in Section 12.3, the attitude uncertainty is obtained directly from the uncertainties of the various observables via the partial derivatives of the attitude parameters with respect to the observables. Although this is adequate for determining the attitude uncertainty for specific values of the observables, it provides little insight into the underlying causes of the attitude uncertainty and does not lend itself to mission or maneuver planning or analytic attitude studies, where a wide range of alternatives are considered. An alternative method, described in this section and in Section 11.4, is to express the attitude uncertainty in terms of three factors (involving the various partial derivatives) which have well-defined physical and geometrical interpretations. We then use this factorization to develop explicit analytic expressions for the attitude uncertainty and to discuss the geometrical causes of large uncertainties to provide the perspective necessary for prelaunch analysis and mission or maneuver planning. In this section, the discussion is restricted to single-axis attitude determined from measurements taken at a single time. The attitude, which corresponds to a point on the celestial sphere as discussed in Chapter 10, is defined as the spin axis for a spinning spacecraft or as the direction of some convenient axis fixed in the body for a three-axis stabilized spacecraft. If the uncertainties in two measurements are due to independent error sources such as random noise or unrelated systematic errors, then the uncertainties are uncorrelated. In other words, an error in one measurement does not imply any error in the other measurement, and vice versa. Alternatively, part of the uncertainties in two measurements may come from the same error source. For example, if the attitude is determined by measuring the Earth width with a horizon telescope at two different times, then a misalignment in the sensor mounting angle would cause an error in both measurements and the uncertainties weT correlated. Measurement uncertainties are also correlated whenever there exists a systematic error which can introduce uncertainties in both measurements. Quantized Measurements. The easiest measurements to interpret physically are quantized measurements, i.e., those for which the measurement uncertainty is the result of the step size or bucket size in which the measurements are made or transmitted. * As discussed in Section 10.4, two measurements, m and n, each imply that the attitude lies within a band on the celestial sphere as shown in Fig. 11-7. 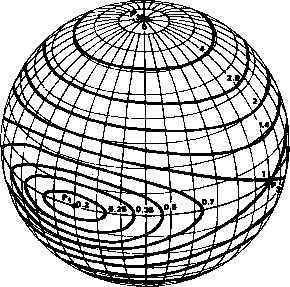 Here, a plane geometry approximation is made such that the constant measurement curves on the celestial sphere are approximated by straight lines. Lm is the locus of attitudes corresponding to measurement m; ALm = Um/dm is the change in the attitude perpendicular to Lm due to the uncertainty, Um (1/2 step size): dm is the measurement density for measurement m as defined in Section 10.1, and &m/n is the correlation angle between measurements m and n, as defined in Section 10.4. The correct attitude solution may be anywhere inside the error parallelogram shown in Fig. 11-7. The probability of the correct attitude being in any small area of the parallelogram is the same regardless of the location within the parallelogram. * In a strict sense, all attitude measurements are quantized by the process of transmitting them as binary numbers. However, we will regard the quantization as important only when the quantization step is sufficiently larger than the noise such that in a continuous string of measurements of an approximately constant observable, only one or two discrete values are reported. For example, the probability of the attitude being in some small area at the tip of the parallelogram is the same as the probability of the attitude being in an equal area at the center of the parallelogram. The probability density, or probability per unit area on the celestial sphere, is constant inside the parallelogram and zero outside the parallelogram. 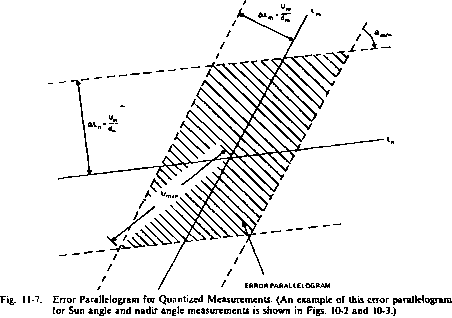 The attitude uncertainty for quantized measurements is the error parallelogram. To fully specify this uncertainly requires both the size and orientation of the parallelogram, which depend on four independent parameters. For example, we could give the width of both bands and the azimuthal orientation of each band relative to an arbitrary reference direction. It is frequently convenient to characterize the attitude uncertainty by a single number. Clearly, this cannot be done in any precise sense because no one number completely defines the error parallelogram. We define three convenient error parameters which may be used depending on the nature of the uncertainty requirements. The component uncertainty is the distance from the center to the edge of the parallelogram along some specified direction, e.g., right ascension uncertainty. 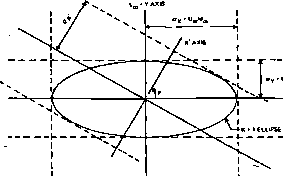 The maximum uncertainty, Umax, is the semilength of the longest diagonal, or, equivalently, the radius of a circle cimcumscribed about the parallelogram. where v is the angle between the x' axis and the major axis of the ellipse. The same relationship holds for the Ka uncertainties in any attitude component.